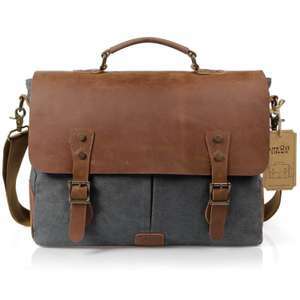 Lifewit 15.6 Inch Leather Satchel Messenger Laptop Shoulder Bag (Grey) £31.99 Sold by Lifewit and Fulfilled by Amazon. Not the cheapest but a good price for a 15.6 inch laptop bag. Only the color grey drop the price for £31.99 now. ​what is quality like ? some reviews on ebay were awful. Handy to store your Jehovah Witness mags. Deal posting newbie! This is JameserSo first deal post. Help out by leaving a posting tip or just to show your appreciation for their contribution.